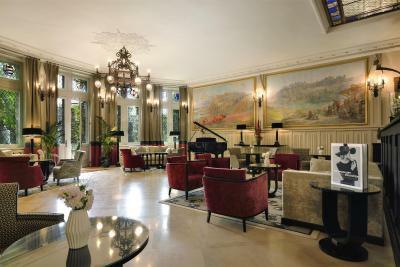 Lock in a great price for Hotel de la Cité & Spa – Mgallery by Sofitel – rated 9.2 by recent guests! Amazing! Great location, beautiful historic hotel, amenities great. Love the history of this place, it’s worth the spend! Everything, perfect location, great staff, clean rooms, comfy beds, etc. Great stay! The restaurant was excellent not only the food but also the service. Fabrice was excellent in suggesting wine pairings and overall service. The food was delicious. The facility was great and the staff wonderful, The spa treatment was exceptional. Our room was large and very quiet, although situated directly on the street. The gardens of the hotel are very agreeable in late afternoon for a well deserved break after walking the streets and visiting the Chateau. 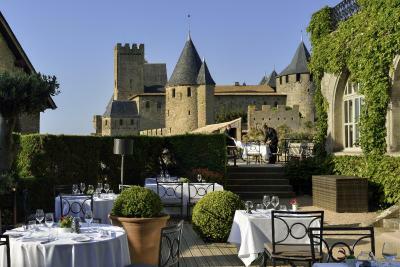 This is THE place to stay in Carcassonne! Old building very carefully restored. The bar is great and the restaurant even better, without being overly foodie. Huge wine list. As always with Mcgallery - wonderful historic site, amazing surrounding (best pictures I ever made), comfortable rooms and fantastic breakfast (yes, pricey, but so worth it!). One of our top picks in Carcassonne.Set in Carcassonne's circular walls, Hotel de la Cite Carcassonne - MGallery Collection is set in a Medieval-style chateau. The hotel features gardens and an outdoor pool with views of Saint Nazaire Basilica. Free WiFi and wired internet access is available. Classic or Provencal-style decoration and an iPod docking station feature in all of the guest rooms at Hotel de la Cite. Some rooms have a balcony with views of the city. 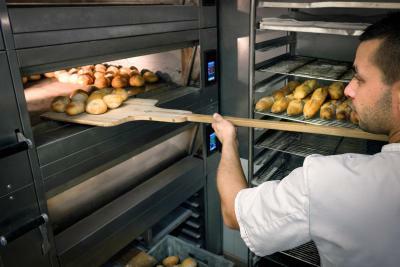 Homemade pastries are served at breakfast and regional dishes are offered in the brasserie and summer restaurant. 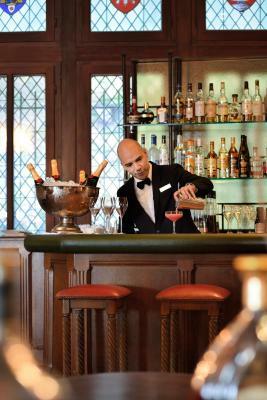 Guests can also dine at the Michelin-starred Barbacane restaurant or enjoy a cocktail in the bar. Guests can go wine tasting in the on-site cellar or organize a river cruise at the 24-hour reception. The hotel has a shuttle service and a valet service available for guests using the private car park. Carcassonne Train Station is 1.5 mi from the property. Narbonne is 38 mi away. Parking is available on site for an additional charge. When would you like to stay at Hotel de la Cité & Spa – Mgallery by Sofitel? This double room has a bathrobe, garden view and electric kettle. 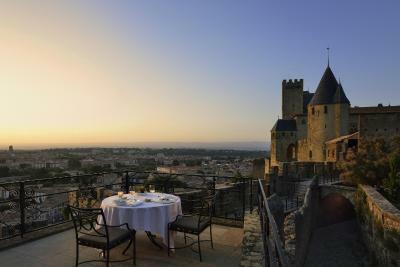 Carcassonne’s old town is an impressive medieval citadel overlooking the new town below. Cross the centuries-old Pont Vieux while you pass through mazelike streets leading to a castle and majestic city gates. House Rules Hotel de la Cité & Spa – Mgallery by Sofitel takes special requests – add in the next step! Hotel de la Cité &amp; Spa – Mgallery by Sofitel accepts these cards and reserves the right to temporarily hold an amount prior to arrival. Hotel de la Cité & Spa – Mgallery by Sofitel accepts these cards and reserves the right to temporarily hold an amount prior to arrival. The hotel is in the heart of a unique historic monument. Measures taken by the local authorities to preserve its environment include restricting vehicle access during the day. The hotel has a shuttle service and a valet service available. Guests are advised to contact the hotel before arrival in order to receive up-to-date information concerning access to the medieval citadel. Beds were comfy, staff very friendly and helpful, location is superb and the ambience in keeping with its historic surroundings. Dinner was highlight in the Michelin star restaurant! The oyster starter and lobster main course off the chart. It might have been slightly overpriced at just under £300 for one night but a once in a lifetime opportunity so i'm not complaining! Amazing experience staying inside the castle, The bed was just ridiculously big and the view from the room of the city below was incredible, watching the sunset over Carcassonne whilst drinking our complementary champagne was a dream come true. Lovely, helpful staff as well and amazing breakfast. Prices at the restaurant were very pricey. We were not immediately aware that the parking was a few minutes walk from the hotel We were also expecting a shuttle from the car park but in fact we were asked to walk which was absolutely no problem for us but could be an issue for someone with mobility problems. Other than that we were very pleased with our stay and thoroughly enjoyed the experience. This hotel was extremely interesting and attractive. We were very warmly welcomed and immediately upgraded to a superior room. The receptionist accompanied us to the room and provided us with a short guided tour and commentary about the building which was not expected but appreciated. The building has a medieval feel albeit it was apparently built in 1927. The hotel feels very much larger on the inside than the initial impression from the outside. It is very tastefully decorated with a whole array of interesting artwork. Our room was spacious and had a terrace which lead out to the town walls with stunning views. The bathroom had a shower over a roll top bath which filled very quickly with piping hot water. We did not eat the restaurant as it was a little pricey for us but enjoyed a very nice cocktail in the bar before eating in one of the many local eateries within the walled town. We would definitely stay again. Couldn’t make a single booking for the spa, in the two days we were there. Fully booked the whole time. When we stayed last month we had a beautiful large room by the court yard, this time the room was much smaller! Staff were very friendly, breakfast lovely, great room and location. Olde worlde atmosphere. The breakfast was amazing, the room stunning, but most important the customer service and all the areas of the hotel were extremely kind!!! Wonderful staff, very helpful and welcoming. The hotel is in an excellent location and very beautiful, however it is run down. The books in the library full of dust, the carpets are old. It is time for a makeover. The property is a long walk from the main city area although an enjoyable one. Isolated but worth at least one night and full day exploring. Great experience staying within a medieval castle. Great views and a historical site. Barbacan restaurant is a good experience.